There may be a variety of reasons why it's important to change your pet’s food. It could be a health condition, a healthier option or a change in the nutritional needs of your pet. However, your cat or dog’s digestive system is much more sensitive then ours and special consideration should be used when changing their food. 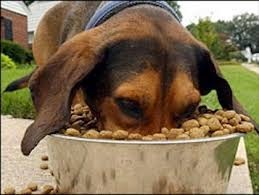 When feeding your pet a new food, introduce it very slowly over 7-10 day period. We recommended the schedule should be ¼ new food with ¾ old food for 3-4 days. If no issues arise, then increase by ¼ every two days until fully switched to the new food. Please, keep in mind that if you introduce the new food too quickly, your pet could suffer from an upset stomach, vomiting, gas or diarrhea. If any of these occur, slow down the process beyond the recommended (reduce the percentage of new food and/or increase days between changes) until the symptoms subside. If your pet's stool is soft, you can add a small amount of pure canned pumpkin (not pumpkin pie mix) to their food. The added fiber should help firm up their stools. Also, Power Probiotic and a digestive enzyme such as K9 Digestive Enzymes will make the transition easier.